For waterfall in Bosnia and Herzegovina, see Kravica (waterfall). Kravica (Serbian Cyrillic: Кравица) is a village in the Bratunac municipality near Srebrenica, in eastern Bosnia and Herzegovina, close to the border with Serbia. It is inhabited predominantly by ethnic Serbs. During the 1992–95 Bosnian War, the village was badly damaged in the 1993 attack, and in 1995 was the place of major killings during the Srebrenica massacre. In 1971 there was a shootout between men from Kravica and men from Muslim-inhabited Konjević Polje. 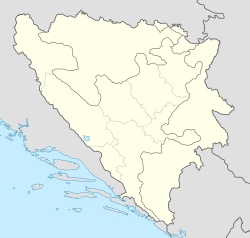 In 1991, it was reported that neighbouring Serb-inhabited Kravica and Muslim-inhabited Glogova "had bad blood". The village was attacked on 7 January (Serbian Christmas) 1993 by ARBiH forces under Naser Orić from the Srebrenica enclave under the control of the ARBiH. Eleven civilians and 37 men from the village who were guards of the village at the time were killed and most of the houses were damaged. [page needed] Men from Kravica participated in the Srebrenica massacre. In 1991, it had a population of 357, of whom 353 were declared as Serbs, with no declared Bosniaks, Croats or Yugoslavs. ^ Jan Angstrom; Isabelle Duyvesteyn (8 July 2005). Rethinking the Nature of War. Routledge. pp. 169–. ISBN 978-1-134-25750-8. ^ JPRS Report: East Europe. Foreign Broadcast Information Service. 1991. ^ "Report of the Secretary-General pursuant to General Assembly resolution 53/35: The fall of Srebrenica" (PDF). United Nations. 15 November 1999. Archived from the original (PDF) on April 22, 2008. ^ "Prosecutor vs. Radislav Krstić: Judgement" (PDF). International Criminal Tribunal for the former Yugoslavia. 2 August 2001. ^ Sarah Wagner (2 October 2008). To Know Where He Lies: DNA Technology and the Search for Srebrenica’s Missing. University of California Press. pp. 275–. ISBN 978-0-520-94262-2. This page was last edited on 26 November 2018, at 05:36 (UTC).